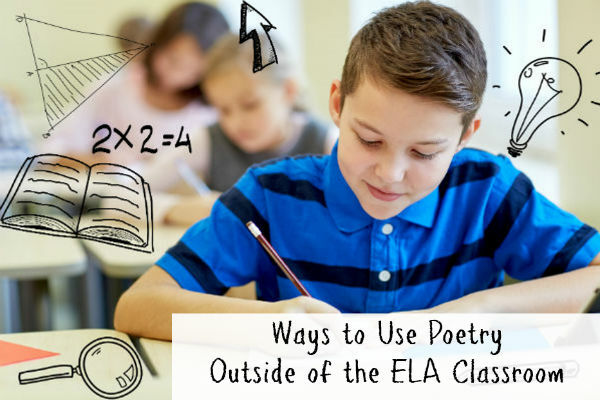 Whether it’s reading poems written by some of the greatest poets of all time or writing poems of their own, students spend a fair amount of time studying poetry in the ELA classroom. While the figurative language and eloquent verses found in poems may seem best-suited for ELA, their relevance extends across the curriculum. From science and math to social studies and foreign language courses, poetry can become an integral part of student learning outside of the ELA classroom. Proposition the first–and Problem the first. –A, N, G, L, E.
To find poetry to fit a specific time in history or concept in math or science, simply perform a quick internet search for poems in your subject area and you’ll come up with numerous examples. You may also check out books of poetry created to help students learn about science, math, and social studies. Mathapalooza: A Collection of Poetry for Primary and Intermediate Students by Franny Vergo, a collection of poems related to basic math. Math Poetry: Linking Language and Math in a Fresh Way by Betsy Franco, a book of lesson ideas, sample poems, and math-related poetry activities for kids. Marvelous Math: A Book of Poems by Lee Bennett Hopkins, designed for students in grades 3-5. Math Talk: Mathematical Ideas in Poems for Two Voices by Theoni Pappas, a collection of poems on middle and high school math topics designed to be read by two students at once. Science Verse by popular children’s author Jon Scieszka, a wealth of silly and informational poems on popular science topics. Joyful Noise by Paul Fleischman, a collection of poems about insects and nature designed to be read by two people at once. Spectacular Science: A Book of Poems by Lee Bennett Hopkins, questions related to science answered in poetic verse. The Poetry Friday Anthology for Science by Sylvia Vardell, helps K-5 teachers incorporate Common Core science into their curriculum through the use of poetry. The Watch That Ends the Night by Allan Wolff tells the story of the Titanic in verse. Harlem by Walter Dean Myers celebrates the people of Harlem in a book written in poem form. Brown Girl Dreaming by Jacqueline Woodson tells the story of a girl growing up in the South, and later Brooklyn, during the Civil Rights Movement. May B by Caroline Starr Rose tells the story of a young girl living on the Kansas Frontier and the struggles she faces. Inside Out and Back Again by Thanhha Lai tells the story of a girl who must flee from her home after the Fall of Saigon and shares what her new life is like in Alabama. Writing poetry can be a way to assess students’ understanding of particular concepts, It also helps teachers incorporate creative thinking skills into the math, science, and social studies classrooms. Students may write poems about particular concepts, people, or events related to the subject area. Retrieved pictures from Hubble Space Telescope. Spent a year on the International Space Station. We have laid the foundation for success. Going farther into the solar system than ever before. Concrete poetry, also known as shape poetry, involves taking a poem and placing it into the shape of an object. Students may create poems to represent mathematical equations, specific shapes, or different areas of science. For example, a poem about photosynthesis may be written in the shape of the sun. The shape of the poem helps add additional meaning and ensure the content sticks in a student’s memory. List poetry is simply poetry created out of a list. The list doesn’t just list items randomly. Instead, it’s a carefully thought out poem, often containing repetition, to cover a topic. A student may write a list poem about a particular concept, a person, or even an event in science or history. Poetry is about more than rhyming a few words on the page. As you read poetry with students or have students write poems of their own, encourage them to pay attention to the words on the page. The figurative language, diction (word choice), and even the placement of the words on the page can help add deeper meaning to poems and encourage students to think critically and creatively about the content being taught. If you’re currently teaching the Common Core ELA Standards, you’re already teaching students to think critically and to look at building their reading and writing skills in new ways. The PARCC ELA assessments are aligned to the Common Core standards you’re already teaching. Those standards just come in the form of intimidating question types such as EBSRs and TECRs. While it may seem like you have to do a lot of teaching to help students figure out all of these question types, you don’t. 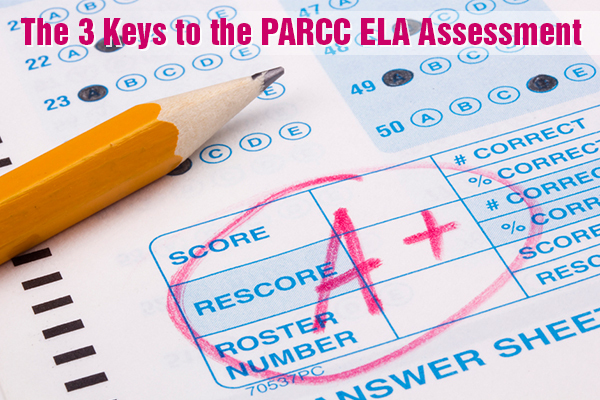 If you want students to be successful on the PARCC ELA assessments, particularly those that deal with reading comprehension, you simply need to focus on three key areas that you’re probably already focused on anyway. According to its developers, the goal of the PARCC is to include “texts worth reading.” These are authentic texts that come from a variety of sources, not texts written solely for the test. These texts also come in a variety for formats. Students may read an excerpt from a how-to manual, a business e-mail, or a newspaper article. They may have to interpret recipes, bus schedules, and advertisements. Whether you’re preparing for the PARCC or simply teaching on an ordinary day, it’s time to decrease your reliance on the textbook and other traditional books and start having students read non-traditional texts. They should be reading newspapers, signs, webpages, e-mails, and historical documents. Look for texts that have charts and diagrams and texts that offer different views of the same topic too. This will help students experience the variety of passage they’ll likely find on the test – and in real life. When it comes to more traditional texts, such as short stories and non-fiction books, students should be perusing digital versions along with the traditional print. Reading a digital version of a passage uses different skills that reading a paper-based version of a passage. Since most students will take the PARCC digitally, they need to have experience reading on a screen. One of the main question types students will encounter on the PARCC ELA assessments is the EBSR. This stands for Evidence-Based Selected-Response. It sounds fancy, but all EBSR means is that students will have to answer a question and back up their answer with evidence. (See examples of EBSR questions on our practice PARCC worksheets) This is what students should be doing in the ELA classroom every day. When students answer a question about a text, do you ask them how they arrived at that answer? That is exactly what the PARCC asks students to do. The only difference is that instead of making them search for the exact answer in the text, it gives them a series of answers to choose from. If students can find the support in the text on their own, they shouldn’t have any trouble choosing the correct answer on the PARCC. If you’re not already encouraging students to provide support when they answer questions about a text, there are a few simple ways to help them. On a paper-based version of a text, have students regularly highlight or use sticky notes to mark the support for a particular answer. When a student answers a question in class regularly ask “why?” or “how do you know?” For students who struggle with finding support for their answers, spend some time modeling your thinking for students as you do a close reading of the text. Perhaps the most intimidating part of the PARCC is the new type of question – the dreaded TECR or Technology-Enhanced Constructed Response. While this format is new to the standardized assessment world, it’s very familiar in most ELA classrooms. A TECR is simply a glorified graphic organizer, something you likely use in your classroom every day. On TECR questions students may be asked to match a sentence from a text with a statement, compare and contrast two ideas, put events into a sequence, identify a problem and solution, or show their understanding of a cause/effect relationship. Help Teaching has a large selection of graphic organizers for you to use with students. The key is to introduce students to many different types of graphic organizers so they become used to analyzing a text in many different ways. For example, you don’t always want to use a Venn diagram to have students compare/contrast. You could also use a T-chart or another type of organizer. The reality is, you don’t have to spend hours worrying about how you’re going to prepare students for the PARCC ELA assessments. If you’re already teaching the Common Core standards as they’re meant to be taught, you’re helping students build the skills they’ll need to be successful on the test. Continue to provide students with a variety of texts, encourage them to support their answers, and help them organize their thinking with graphic organizers. Then build their confidence by telling them they have the skills they need to ace the test.